Irrigation And Sprinkler System Jacksonville: How Often Should You Water? How Often Do I Really Need To Water My Lawn? This is a legitimate question, especially when you’ve got that one neighbor who seems to be giving his lawn a drink every single day of the week. With water conservation at the top of people’s minds these days, it’s important to use irrigation and sprinkler systems responsibly, even in the moist climate of Jacksonville. We decided to round up some of our best irrigation and sprinkler system tips so our customers could feel confident in how they’ve programmed their watering schedule. Remember, if you don’t have a sprinkler system or simply don’t have the time to worry about if and when your lawn is getting watered, our commercial and residential landscaping services are always available to you! 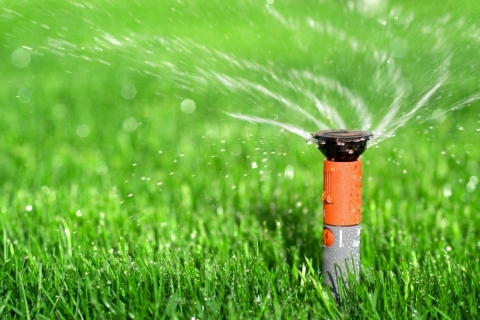 Before we reveal the hard and fast rule for correctly watering your lawn, let’s explore some of the irrigation and sprinkler system mistakes we’ve seen people make all over Jacksonville. Sprinkler systems running in the blazing hot sun – When it’s hot outside, a large percentage of the water that’s flowing out of your sprinkler system will evaporate long before it even gets close to the roots of your grass. Sprinkler systems running when it’s raining – This happens all the time when people have sprinklers set to go off at the same time each day. Contact C&L Landscaping to ask about rain sensors that could tell your system to turn off during a programmed time if water is already falling from the sky. Sprinkler systems that aren’t properly aligned – This is a major waste of water in Jacksonville! Irrigation and sprinkler systems must be re-aligned every year to ensure that water is landing on your grass and not on the street, driveway, or on the neighbor’s car. Now that you know what NOT to do when it comes to irrigation and sprinkler systems, let’s talk about things you SHOULD do. Know your grass type – The type of grass that’s planted in your lawn will help you to set up the right watering schedule. Some grasses are known to be drought resistant, so they can go longer between waterings, while other grass is more delicate. Water at the right time of day – As we’ve already mentioned, the right time is NOT at the hottest point of the day or when it’s raining. The best time to water your lawn is right before or after sunrise, around 5 or 6 am in the morning. This ensures that as much water as possible will be absorbed before the sun is fully up. So, how often does your lawn need to be watered? No matter where you live or what kind of grass you have, the rule of thumb is that grass should be watered deeply no more than three times per week. If you need more help programming your irrigation or sprinkler system, or are interested in new sprinkler system installation, contact the experts at C&L Landscaping in Jacksonville today!